I decided to use this piece of whimsical art as a writing prompt for a impromptu short story. Have you ever wondered how the moon stays so bright at night? I mean think about it, it covered in dust and rocks. Wouldn’t that mean the moon should be dark? 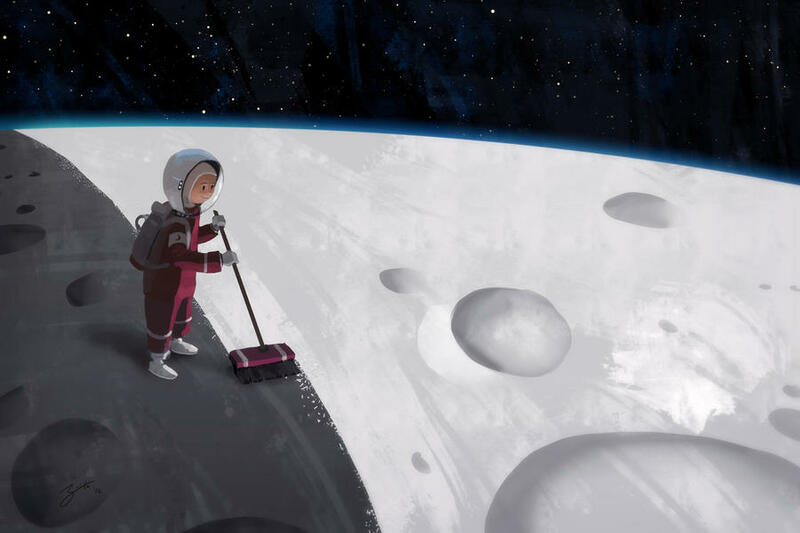 If you answered yes, then you obviously don’t know of the kid who cleans the moon. You see it’s his job to keep the moon a bright white. Every thirty days he starts at the edge of the moon. With just a push broom for a brush he makes his way across the entire surface, sweeping and cleaning. He works mostly through the day. That’s why at night sometimes you only see a sliver of white moon and others half or more. But it’s at the end of his cycle that the moon shines the brightest. No one knows how he got the job. Some say it was his punishment for not eating all his beans. Others think he was left behind after the third mission. But I know the truth, and I’ll share the story. When he was just 5 years old he looked up at the dark night sky. He could just barely see the moon but it was so dark it made him sad. He thought, “Maybe if the moon had a friend it wouldn’t be so lonely.” The very next day the boy set out to build a rocket ship to take him to the moon. The boy worked every day on his rocket and at night he would stare up at the sky. By day he attached wings and tested the steering mechanism. From his bedroom window at night he would talk to the moon. The conversations were always short. The moon never had much to say. Finally, the day arrived and his ship was complete. The boy donned his space suit, it was really just his pajamas with rain boots and dish gloves attached with tape. He put on his helmet and pack, a fish bowl and busted vacuum cleaner. He loaded his cockpit with buckets and rags and brushes. When he was sure everything was ready, the boy climbed into his rocket. Counting down from ten he flipped the ignition switch at zero and blasted off into space. The rocket landed with a thud and the boy stepped out to look around. There was dust and dirt everywhere and not a mom in sight to clean things. Well no wonder the moon was so sad, the boy thought. He pulled out his broom and bucket and right away got to work. The boy swept and wiped and as he did the moon began to shine. The boy talked to the moon, told him about his home, about his dog and friends at school. He talked and swept and brushed until the entire moon was bright and white. When he was done the boy leaned on his broom and looked over his friend. The moon was happy. It was bright. It was no longer sad nor lonely. But the mood got darker and sadder still. For a moment the boy wasn’t sure what to do. He turned to look at the earth, back at his home. Then he looked again at the darkening moon and made up his mind. “Okay. I will stay with you,” the boy said. “I will stay to keep you company, to keep you clean and happy.” And with that the boy set off to the dark edge of the moon at started his work again. And that’s the story of the kid who cleans the moon.